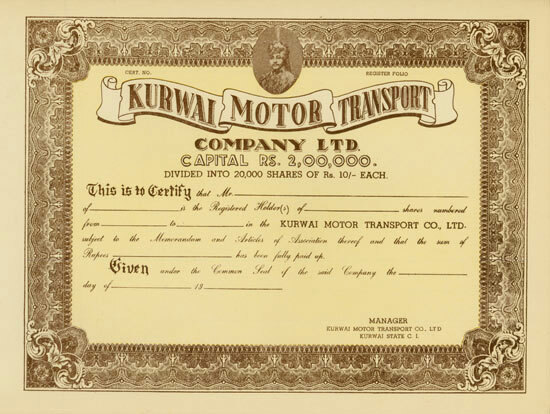 HWPH AG - Acciones antiguas - Kurwai Motor Transport Company Ltd.
Kurwai Motor Transport Company Ltd.
19__, Blankett über Shares á 10 Rupees, o. Nr., 24,5 x 32,8 cm, braun, ocker. 19__, Unissed certificate for shares á 10 Rupees, o. Nr., 24.5 x 32.8 cm, brown, ocher.